Laila Raguig, 40 years, and with 2 Dan. She lives in Marrakesh, Marocco. She started judo in 1998 as a 24-year-old and joined the club “Kasr el Badia”. She train kids between 4-14 years of age, and since january 2013, she is a returning member of Morocco”s national women”s judo commission. She wants to encourage women to practice judo, even if they are over 40 years old. So they can discover a wonderful world of judo. Laila is also a founding member of the large and popular group Judoholic on Facebook. “In Morocco, there are over 500 clubs. As a Secretary General in Marrakesh Haouz-Tansift Judo Institute and I will take my place. I work with the chairman and members of the league and also with the Moroccan federation. 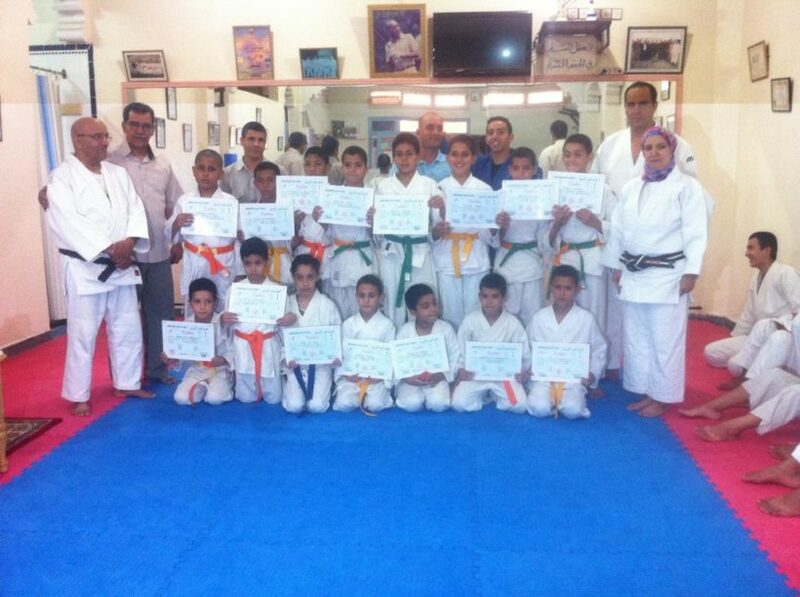 We are arranging the first international judo tournament for cadets and juniors that will be held in late November 2014 in Morocco. 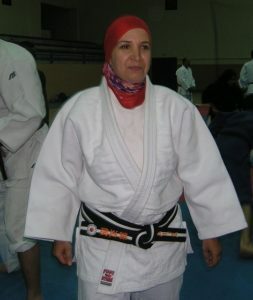 I am also the first female president of a regional league in Moroccan judo history. This year I passed the Continental referee exam, so now I hold IJF-C, but I referee only in Marocco. Just because of my hijab, it is not yet permitted in other countries. I hope IJF rules become more flexible eventually to allow women to wear a hijab as both contestants and referees. When I was a child I was a unique girl. My brothers came 10 years after me, it meant that I did not play so much during my younger years. I grew up isolated and alone. When I started judo, I discovered more playing with others, and it was an opportunity for me to get new friends. To learn self-defense, to transfer the moral code of judo to a code of life. I started out 24 years old and my judo experience can motivate many other women to start. I want to encourage women to train Judo although more than 40 year olds, so they can get to discover this wonderful world judo. I have created Judoholic 5 years ago, we are now 7000 members and 10 administrators from seven different parts of the world. Sensei Jose Rosito Junior (BRA) .Vinko Pansvenki (POL) .Elmar Babanli (AZE) .Christelle Renoux (FRA). Marianne Lesage (GBR) .Youssef Judomane (MAR) .Yassir Dahbi (MAR) .Moad Fajri (MAR) and myself.